You Must Outplay Nature to Outwit Deer. Well, I don’t really hate them, but the dislike is powerful since they have caused me to lose shots a couple of times. I did everything right. I wore camo, set up my stand with the prevailing wind to my advantage and used scent killing sprays by Hunter Specialties. My tripod was even extremely well hidden from the deer with no real way they could spot me. However, in hindsight, there was one weakness. Although the cover below the stand was great, I was exposed above it. No deer would be able to view me, but I was in the wide open for the crows. You see, it is not just important to fool whitetails, feral hogs, elk or whatever big game you are hunting. You must fool all wild creatures. Wild animals understand the distress signals of others and will flee or approach an area extremely cautiously when an alarm is sounded. For hunters who believe they can enter the field wearing cologne, using no sort of camouflage and certainly not paying attention to scent maskers, here are some things to think about. 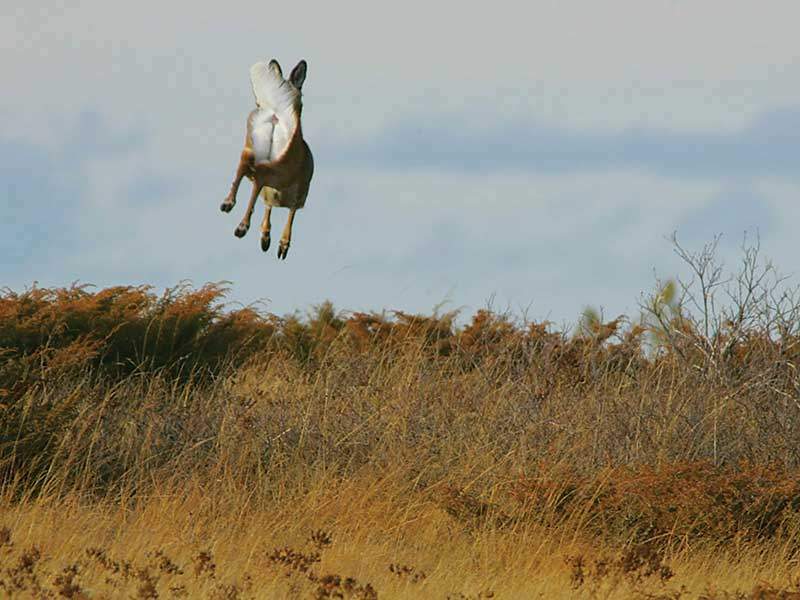 Even though you might play the wind, you cannot be certain your deer will come from the direction you wish. Even if it does, a hog might come up the trail just about the time you are about to squeeze the trigger, and let out a grunt as it winds you. Your opportunity has passed you by. For those who go the extra mile in using pattern-breaking camouflage and are experts at scent control, there are other things to think about as well. A sight all too familiar to many hunters, even those who have taken care to mask their presence. How well are you hidden from above? As shown in the earlier example, birds such as crows can and will bust you, announcing your presence to everything in the woods. Hiding from them requires some using camouflage draping or natural vegetation to conceal you and your movements. Hunters using box blinds may want to attach sticks and limbs from the legs to the top to break the “boxy” look and create something that looks more like a tree. An area I have always believed Texas hunters (myself included) have really dropped the ball in fooling wildlife involves repetition. We hunt the same stands, day after day, season after season. Wildlife, particularly deer and hogs have this figured out. “If you hunt the same stand three days in a row or more, the deer have you patterned. We have proved this in our research, and it is a big stumbling block to some hunters’ success,” said renowned deer biologist Dr. James Kroll. Feeders are a huge part of this equation as they are the primary way hunters score on big game in Texas. However game camera technology lets us know that the largest and wisest deer, hogs and even exotics will visit feeders only when the hunters are not there. Although I believe corn feeders can give hunters an advantage, they can also weigh them down because their use is so commonplace. What if there was something deer needed as much or more than food that could be dispensed similarly? Enter the Oasis Wildlife Water System. At first appearing like a standard fluid storage barrel it utilizes a provisionally patented vacuum system to automatically replenish water to the tray as the animals drink from it. “Our water system has been field tested effectively in East, Central, South, and Southwest Texas with great results,” said Beaumont-based Jack McElroy. It is something animals do not expect. Travel west and you’ll find hunters who routinely hunt over water sources, but rarely in Texas. In a drought year such as the one we are experiencing, a water source will draw game in. This is true whether it’s artificial such as the Oasis system or a natural one. With antler restrictions in place in much of the state and more hunters attempting to score on large bucks, the game is turning from killing a deer to killing a wise, mature deer. Those are two entirely different things. I remember the first time I hunted with my good friend TF&G Editor-At-Large Ted Nugent. We were on a piece of property that was inundated with hogs. Most hunters targeted feeders but Nugent preferred backing away from them and using pruning shears to make shooting lanes. These days very few of us have much disposable time to invest in our hunting. The limited time we spend afield must be more productive than ever, and that requires fooling all of the wild, not just deer. After all it does not matter if a spooked rabbit clears the area or a wise old buck sniffs you out, the opportunity is gone. However, a few creative ideas can help hunters make those opportunities pay off instead of passing you by.